This unusual volume presents an overview of Jean Piaget's work in psychology--from his earliest writings to posthumous publications. It also contains a glossary of the essential explanatory concepts found in this work. 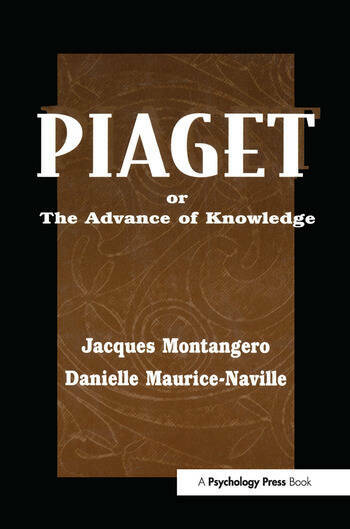 The focus is on Piaget's psychological studies and on the underlying epistemological theses. The book may be consulted in various ways depending on whether one is looking for an introduction to Piaget's theory, details about a particular concept, a survey of his body of work, or a historical perspective. Readers who are relatively unfamiliar with Piaget's ideas and seek access to them through this book will not necessarily proceed in the same way as those who are acquainted with Piaget's work and wish to refresh, synthesize, or complete their knowledge. * The Chronological Overview presents Piaget's early ideas and the most important sources of his inspiration, and reviews his research work dividing it into four main periods plus a transitional one. * The Glossary covers a number of explanatory concepts which are essential to Piaget's theory. Contents: B. Inhelder, Foreword. Preface: Contents and Advice on How to Consult This Book. Part I:Chronological Overview of Jean Piaget's Psychological Work. Part II:Glossary of Essential Terms in Jean Piaget's Psychological Theory. "This new dictionary has been devised in a comprehensive way and is the result of genuine research work. In it can be found a finely shaded variety of definitions, tackling both the meaning and the history of the words listed. A number of pertinent examples illustrate the notions presented and the authors offer a personal synthesis. Whether the reader is little acquainted with Piaget's work or very knowledgeable, each will discover unforeseen angles and enlightening points of view."